I’ve been enjoying highlighting some of our morganite engagement rings lately. Morganite is a wonderful engagement ring option because the morganite has a romantic peachy pink hue and is an incredibly affordable gemstone. The morganite rings in this collection are also ideal to be worn as pre-engagement rings or even cocktail rings. 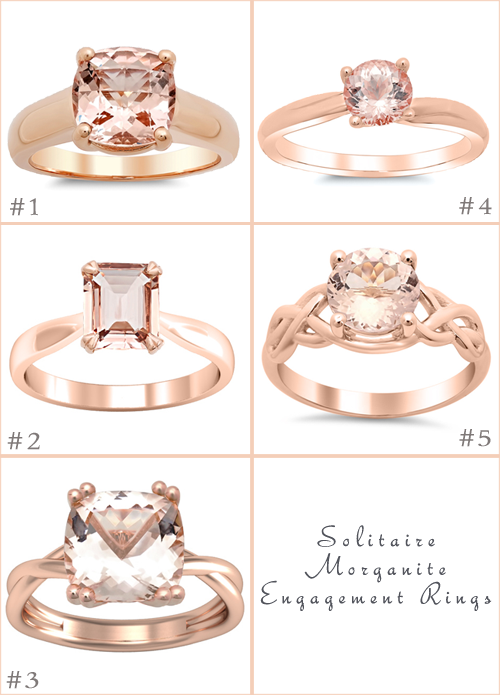 Today, I wanted to highlight all of our solitaire morganite engagement rings. Each of these ring settings features only one prominent morganite gemstone. Each setting may be made from 14 or 18 karat white or rose gold, palladium, or platinum. Each of these engagement rings may currently be purchased for under $1500.00, making them not only beautiful, but affordable. 1. Morganite Trellis Solitaire Ring, currently starts at $795.00. 2. Tapered Emerald Cut Morganite Solitaire Engagement Ring, currently starts at $945.00. 3. Cushion Morganite Solitaire with Twisted Rose Gold Band, currently starts at $1,160.00. 4. Morganite Twisted Solitaire Engagement Ring, currently starts at $1,167.00. 5. Celtic Knot Morganite Engagement Ring, currently starts at $1,390.00. Rose gold is the most popular precious metal choice for a morganite engagement ring because the rose gold enhances the color of the gemstone. However, white metal options have also become increasingly popular and may provide a more timeless appearance overall. Whichever precious metal option that you choose, deBebians will create each of these rings to order in the needed finger size. If you are interested in a more elaborate morganite engagement ring, please browse our entire collection. We carry morganite engagement rings that feature accent diamonds in an array of timeless styles.